In Malaysia developers were required to set aside 30% of the houses they build to be low cost houses. Implemented and amended to varying degrees by State and Federal Governments through the years, it has been clear for some time that there were serious problems with this policy. At the turn of the century the ceiling price of low cost houses had greatly exceeded the cost of constructing them. Developers placed the low cost housing in the most undesirable locations in their site, and spent as little as they could to minimize their losses. But the resulting low quality of the houses made them unpopular. By 2005 nearly 3000 completed houses in the low cost category were unsold. In many instances the vacant properties became dilapidated and had forced sale value of the low cost houses were a fraction of the original selling price. It appears that developers were being forced by government policy to build houses for poor people who did not want them. To make things worse, the low-cost housing policy had the unintended but nasty side effect of discouraging developers from building houses that people with middle income could afford. With every seven houses having to subsidize three low cost units, there was much more money in high end houses to bear the tax burden compared to middle cost ones. This was in effect a very regressive tax on house buyers. Developers responded by building more high end units and fewer medium costs ones. More recently the federal government finally introduce a separate “Affordable Housing” initiative, but many of the negative elements of the low cost housing policy still remain because State Governments have the ultimate say in land matters. Whilst the low cost housing policy was in effect, trying to get developers interested in Honeycomb housing in the medium cost segment was extremely hard, but these ideas now are easier to apply to affordable housing than low-cost. The level of requirement for low-cost housing is now much lower. Instead of a blanket 30% requirement, the policy is now much more nuanced, some areas require 20%, others only 5%, and still other areas where there is no requirement at all. Still, the it is argued that the poor should still be given opportunities for home-ownership. For a possible solution to this problem we looked towards another building type that is very common in Malaysia – the shophouse. According to Wikipedia(2007) the term ‘shophouse’ is an architectural building type that is both native and unique to urban Southeast Asia. This hybrid building form characterises the historical centres of most towns and cities in the region. Shophouses typically display the following features. Mutifunctional, combining residential and commercial use. The ground floor of shophouses were used for business and trading, and the proprietors lived on the upper floor. Low-rise, typically two to three storeys high. Terraced urban buildings, standing next to each other along a street, with no gap or space in between buildings, with a single party wall separating the shophouses on either side of it. Historian, Jon S.H. Lim, adds another important feature, and that is the ’five-foot ways’, and he traces this to the Raffles ‘Ordinances’ (1822) which stipulated “ all houses constructed of brick or tiles have a common type of front each having a verandah of a certain depth,open to all sides as a continuous and open passage on each side of the street”. This building type evolved according to changing needs from the late 18th century during the colonial era, into the post-independence era, until today. 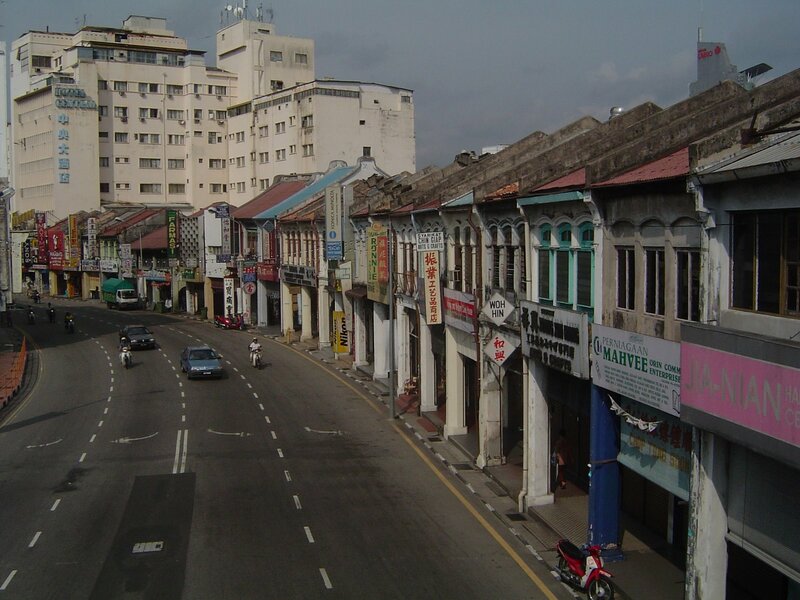 Shophouses inhabited by a single proprietor and his extended family, became tenanted buildings; double storey became three storey and higher; the upper floors gained direct staircase access from the ground floor verandah; the single proprietor building became a subdivided building with separate strata title ownership. The traditional shophouse building evolved to create new categories: the shop-apartment and the shop-office. Of the two, the shop-office have become more common than the shop-apartment. This is unsurprising as apartments above shops are unattractive for families to stay in. There is a lack of green space and amenities for children and the street below is not safe for children. However, offices on the upper floors is only suited to main town or city centres. The upper floors of shop houses in many suburbs and the country side are usually under-utilized. If the design of shop-houses can be improved to make it more acceptable for families, then the upper floors can be a very suitable location to place low-cost housing.